Causes of heart burn are wide and varied. Over indulgence in fatty or refined foods, coffee and alcohol can trigger off heart burn. Smoking, stress and over eating can be other causes. Treatment naturall y includes medication and if it does not prove effective, ultimately surgery is resorted to. If left untreated, long term suppression of stomach acids can lead to chronic digestive problems. There is also the danger of infection due to over growth of bacteria, which is usually controlled by stomach acid. It’s always better to resort to home medication rather than spending a fortune on over the counter medication to alleviate symptoms of heart burn. The most commonly used remedy is of course, apple cider vinegar. It’s advisable to sip a tablespoon of unfiltered apple cider vinegar in eight ounces of water during meals. The vinegar dilutes the stomach acid and alleviates reflex symptoms without impairing digestion. Apple cider vinegar is rich in vitamins and trace minerals. Furthermore, it provides an alkaline environment while helping to destroy harmful bacteria. Cinnamon is also an excellent remedy for all digestive problems including heart burn. It aids in reducing stomach acids and also has antibiotic and anti fungal properties which aids in digestion. Ginger too helps to calm stomach acid and relaxes the muscles of the esophagus. Sip tea made with the roots of fresh ginger to which a pinch of cinnamon is added, this helps to relieve symptoms of heart burn. Heart burn causes at times, a sensation of burning and acute chest pain that emanates from behind the breast bone and proceeds to the neck and throat. This pain and pressure can sometimes last up to two hours and most often worsens after eating. Some plausible causes can be attributed to bending over, tight clothing or lying down immediately after meals. Those normally affected with symptoms of heart burn would do well to refrain from taking caffeinated beverages, citrus fruits, chocolates, acidic vegetables, mint, spicy foods and fatty foods. Smoking too can aggravate heartburn symptoms. Next time you reach out for antacids to alleviate your heartburn symptoms, consider making simple but effective changes in your eating habits. Eating too fast or eating certain foods can trigger off heart burn. 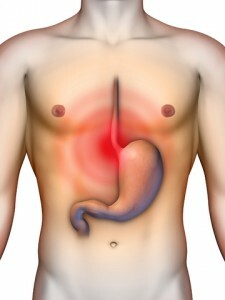 Most of us know that heart burn manifests when foods mix with acid to form a liquid that moves up into the esophagus. This causes chest pain or a burning sensation in the stomach. Antacids while blocking the stomach acid effectively blocks out the absorption of nutrients and hinder proper digestion. Apart from interfering with proper digestion, and nutrient absorption, over the counter medications do produce startling side effects. Most antacids contain aluminum compounds that cause constipation, magnesium compounds causing diarrhea, sodium bicarbonate which triggers gas and bloating, and calcium carbonate which induces the stomach to create more acid than usual. What can be done to address this chronic heart burn conditions? Start out by reducing intake of onions, garlic, hot and spicy foods, fatty or greasy foods, fried foods, highly acidic foods like tomatoes and citrus. Chocolate and coffee can also be culprits. Refrain from eating too fast, do not lie down immediately after a heavy meal and do not gorge on food. If you do experience heart burn, you need to immediately drink a glass of water. Heart burn actually begins as a signal of water shortage in the body. Water can alleviate most symptoms of heart burn more easily than any medication. Stress can be a major contributory factor to heart burn. Alleviate and reduce stress by resorting to breathing and daily meditation techniques. Keep track of foods that trigger off heart burn in you. Avoid citrus fruits, citrus juices, chocolates, pepper mints, alcohol consumption in excess, red wine, coffees, cola and all carbonated drinks. Resolve to eat smaller and more frequent meals. Large meals tend to expand the stomach and can cause an increase in the upward pressure against the esophageal sphincter. Do not go to bed immediately after a meal. Wait for two to three hours before you do go to sleep, since gravity aids in keeping stomach juices from backing into the esophagus. It also helps in the proper flow of food and digestive juices from stomach to the intestines. Raise your head a little higher than the stomach, using pillows, while lying down. Lying down flat can increase pressure on the stomach. As far as possible, cut down on smoking as it stimulates production of stomach acid. If despite all precautionary measures, heart burn still affects you, try some of these home remedies. Baking soda is a natural antacid. Dissolve a teaspoon of this in eight ounces of water. This helps to neutralize acid. Bananas are again natural antacids. Eat either fresh or dried bananas. Chamomile tea neutralizes stomach acid. It’s a stress reliever too. Ginger is one of the time tested remedies for heart burn. It can be cooked, eaten raw or consumed as ginger tea. Turmeric stimulates digestion and prevents acid build up. It is very often used in curried foods and is a natural antiseptic too. Aloe Vera is yet another home remedy for heart burn. Aloe Vera juice is highly alkaline, so it neutralize stomach acid. This juice without any additives, can be used to calm down irritated esophagus.